Good only for rapid fire, practically unusable out of box. 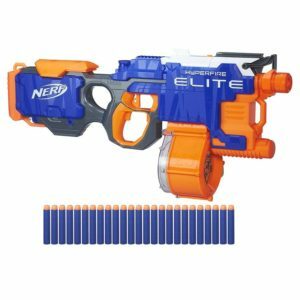 The Nerf Elite Hyperfire is one of the more exciting releases this year, being a full auto blaster that is seemingly a replacement for the now hard-to-find Rapidstrike (in Australia at least). 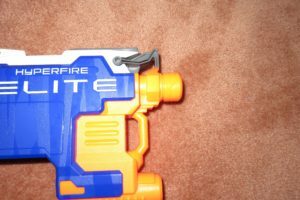 There are a lot of differences between the Rapidstrike and Hyperfire, and a lot left to like about the Rapidstrike. 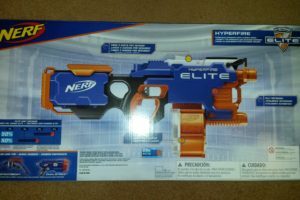 Can the Hyperfire live up to expectation? The box is pretty standard stuff, standard performance claims and feature callouts. 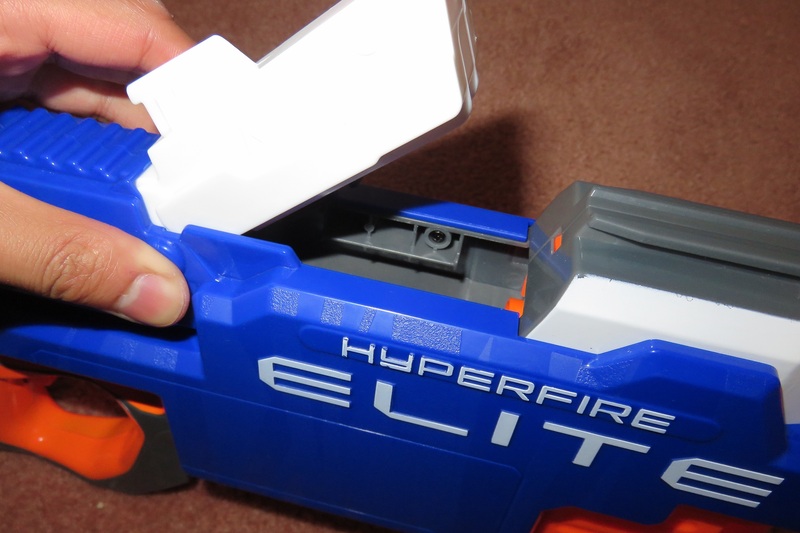 The Hyperfire packaging has no paper ties–just folded cardboard cutouts holding everything in place. Right side of the Hyperfire. Tac rail at the front. Two sling points up front. Two sling points on the stock. Close up of the stock piece. 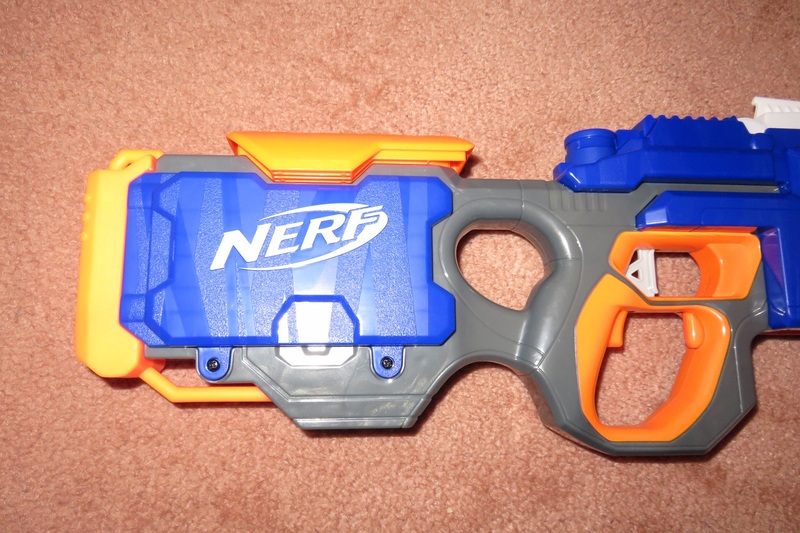 The Hyperfire is an oddly styled blaster. On the one hand, it has a lot of the sharp edges and lines we’ve come to expect from the Elite line. On the other hand, it has just one tactical rail up top, and an unusually large front end. It seems to be a clash of the “tacticool” modern look of Elite with a more futuristic sci-fi styling. 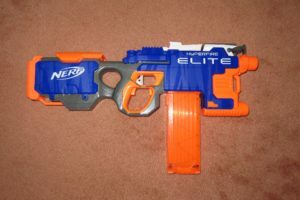 I kind of miss all of the (mostly useless) tacticool stuff Nerf could have added–for me, that was part of what made the Elite series. In fairness, it could be argued that tacticool is more the point of the Modulus line. 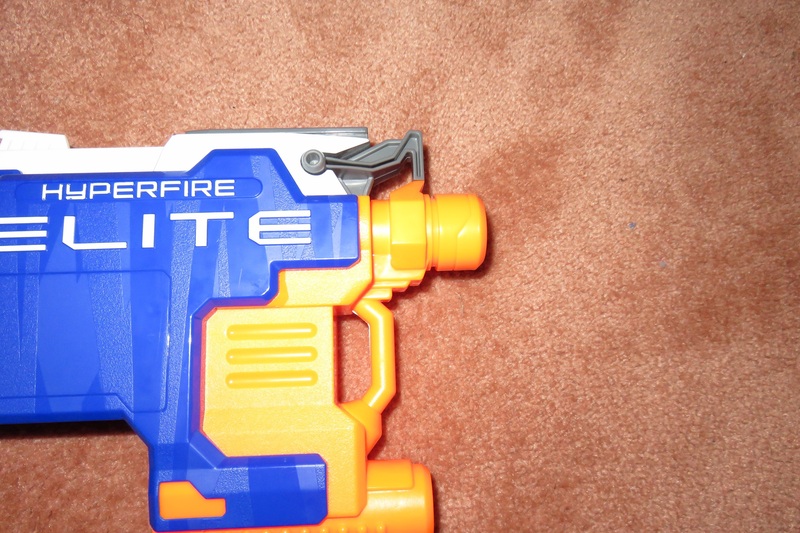 The Hyperfire uses 4 D batteries, which are placed in the stock. While this does add significant weight to the back, it helps balance the weight from the bulky front end. 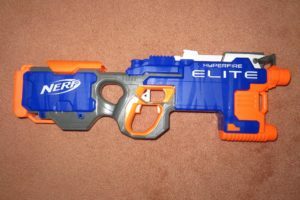 Front end of the Hyperfire. Left hand on the fore end. 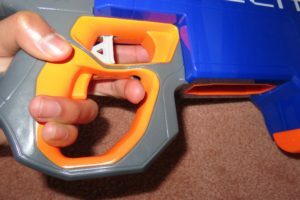 Stock and handle of the Hyperfire. Cheek rest on the stock. One of my first gripes with the Hyperfire was the front end. When the first pictures of it were revealed, I was immediately put off by its unnecessarily large size. To me, it looked ugly and not ergonomic. Now that I actually have one on hand, it’s not as ugly as I first though, but it does still present an ergonomic issue. The only grip point on it is the round piece at the bottom. 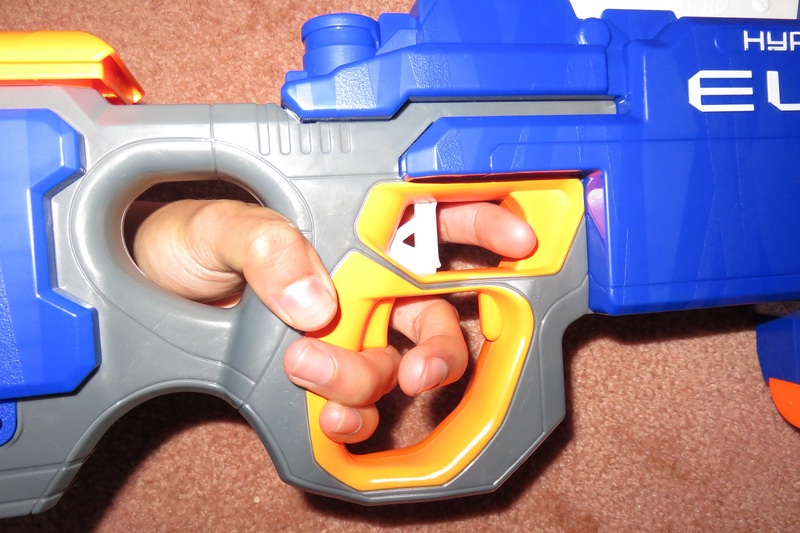 Although it is comfortable, it is also much lower than a natural fore-end grip position. 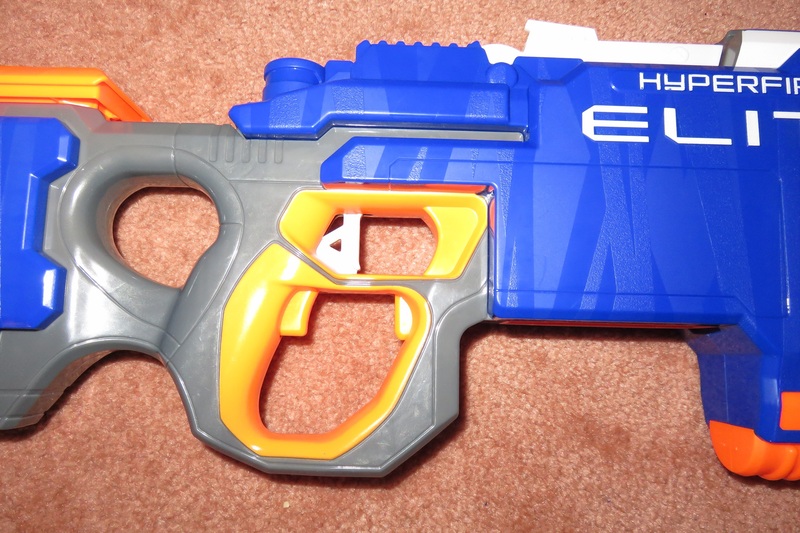 It’s not as bad as the Demolisher, for instance, but it’s still a lot lower than a Rapidstrike. I would have much preferred if that round piece were much higher, just under the muzzle. The stock is a thumbhole design, and it’s not the worst stock I’ve seen. The thumbhole design is neat, and the cheek rest is a nice (albeit totally unnecessary) feature. 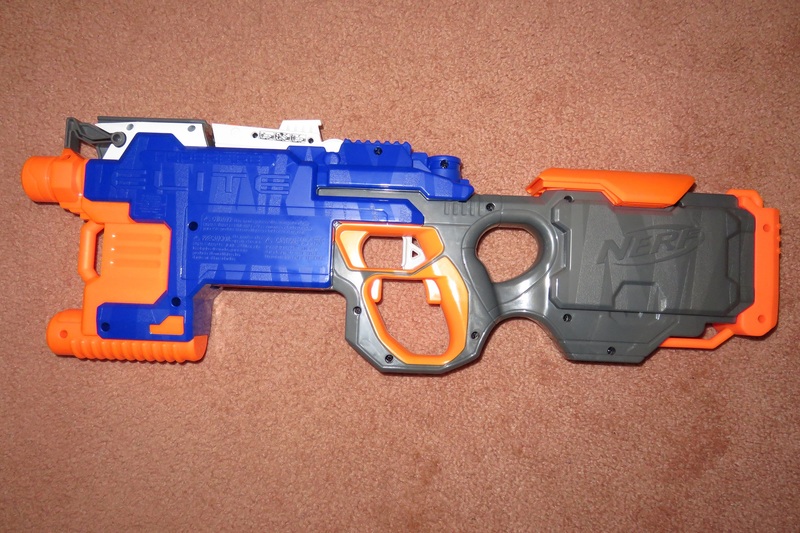 Lengthwise, the stock is decent–a little short for my liking, but certainly not Retaliator stock short. Offending area of the thumbhole stock. The handle is decently designed–it’s smooth and fairly comfortable. The handguard could get a little squishy if you have particularly large fingers, but for me is fine. 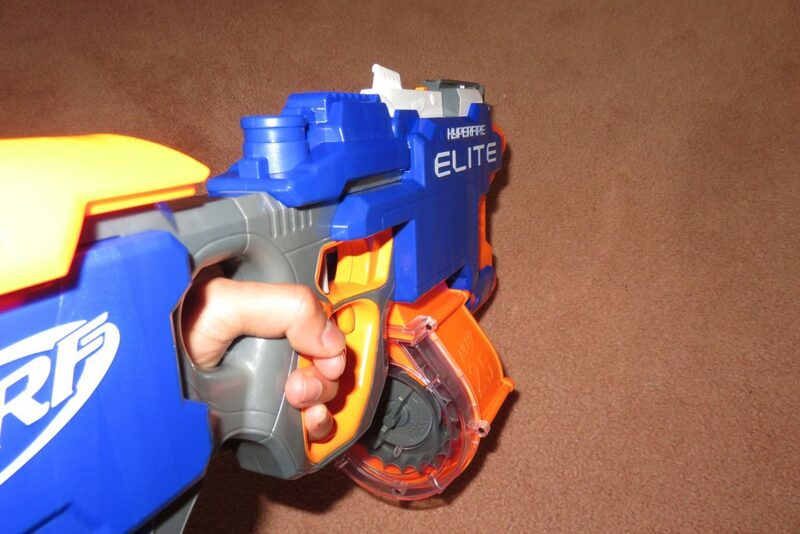 The clip release is well set up and is easily actuated. Its placement inside the handguard means you won’t be able to actuate it easily with your off hand, though that’s only a problem if you’re doing something like a bull-pup Hyperfire. Unfortunately, the otherwise good handle and stock are ruined by the thumbhole stock design. In the process of making this thumbhole stock, the battery tray has been put very close to the handle. 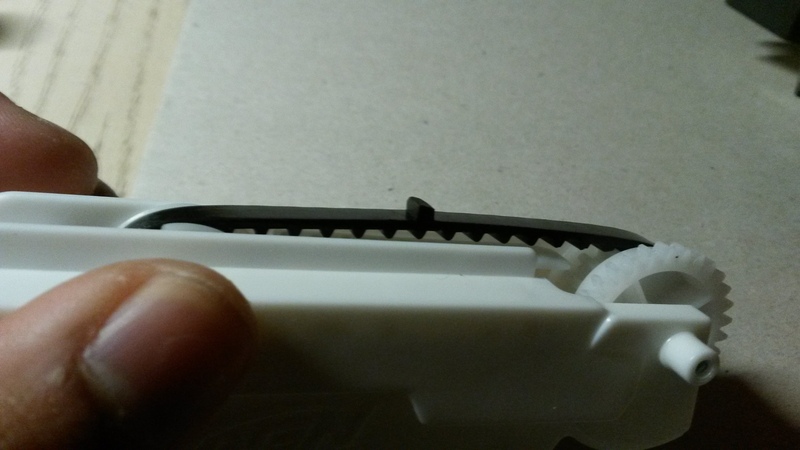 I find that holding the handle normally will cause the edge of the battery tray to dig into the inside of your hand. While not the worst I’ve held, it’s certainly annoying and somewhat uncomfortable. Jam door on the top. 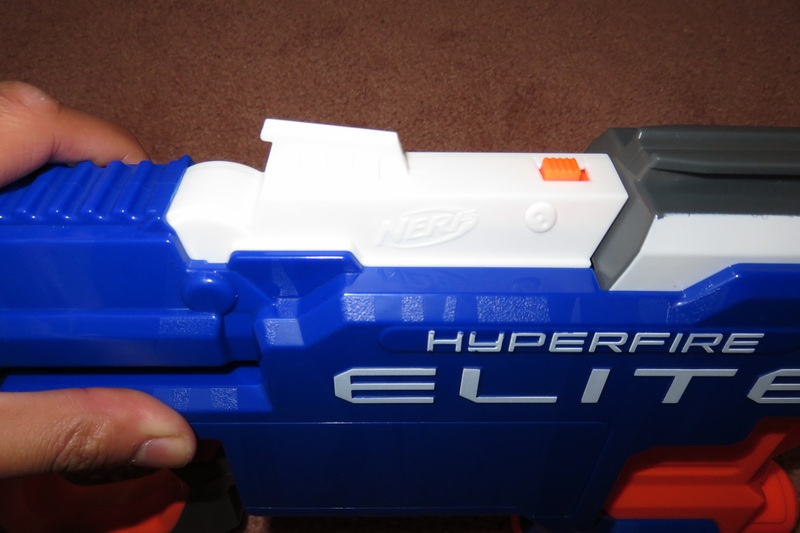 The jam door carries a lot more importance in the Hyperfire than most other blasters. 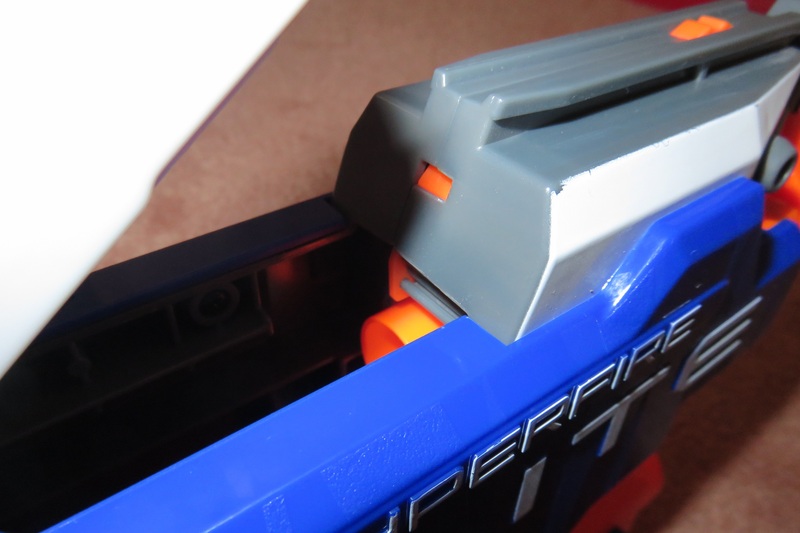 The Hyperfire uses a unique conveyor belt feeding mechanism, unlike the Rapidstrike’s motorised pusher. This conveyor belt is housed inside the jam door. A switch disables the blaster if the jam door lock is open. 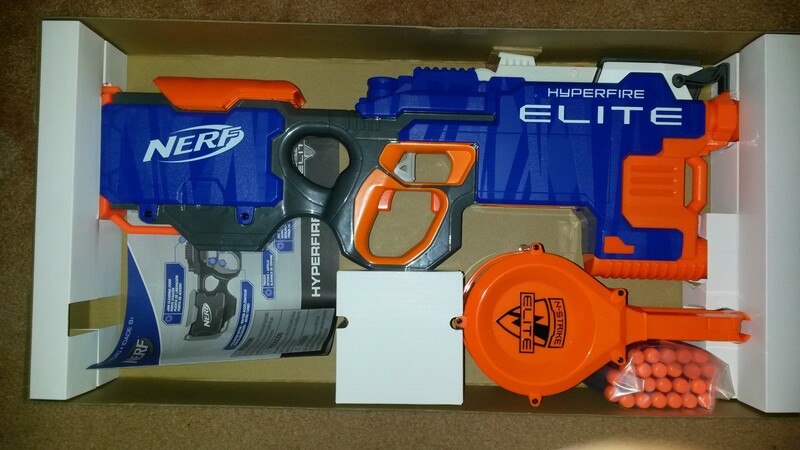 The Hyperfire also has all of the standard locks and safety switches you’d expect in a flywheel blaster. 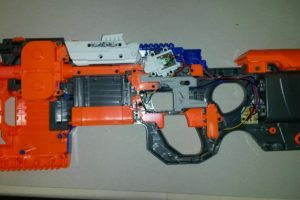 Unfortunately, the jam door on the Hyperfire has two main issues. The first is that the jam door does not open very far due to the conveyor belt design. The aperture exposed by the jam door is quite narrow, and the jam door does not open out very far. This makes jam clearing through the top quite difficult. 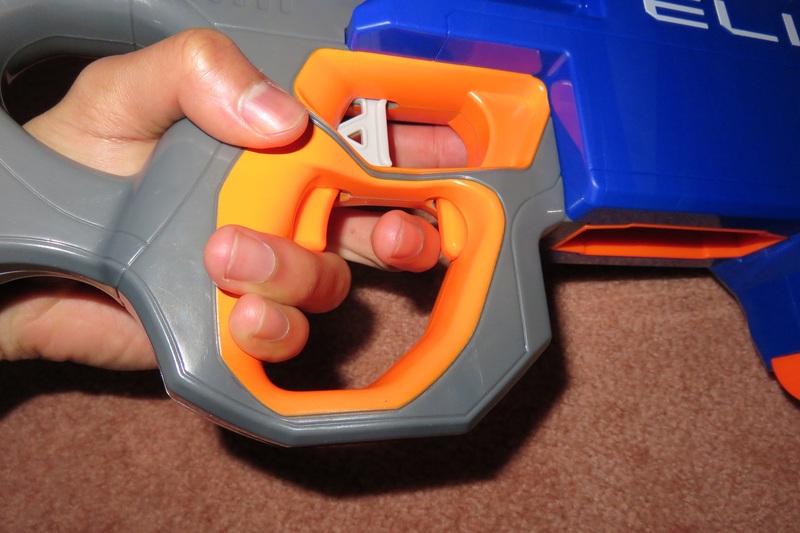 Thankfully, most flywheel blaster jams I’ve observed can be cleared simply by pulling out the mag. The second issue is, by far, the more severe. If the aforementioned jam door lock is even slightly out of position, the blaster will be disabled. This wouldn’t be a problem if the lock was stiff, but it can be dislodged extremely easy. 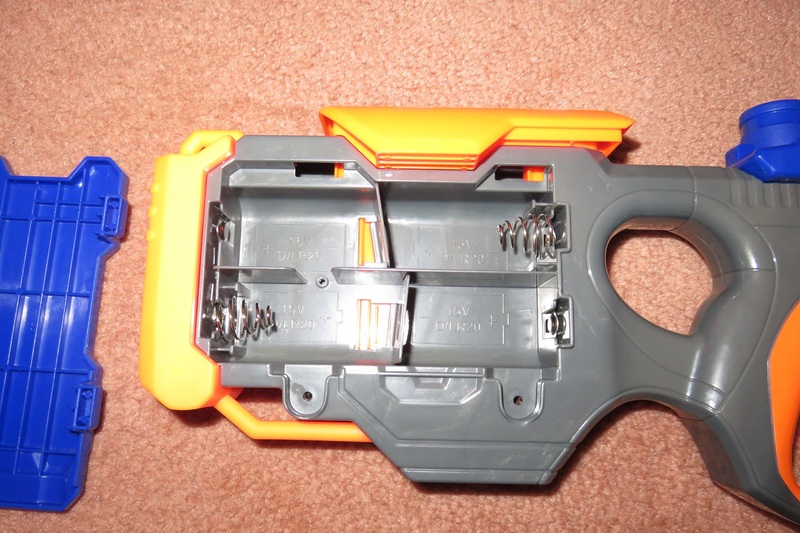 Switching mags with any sort of force will dislodge the lock. 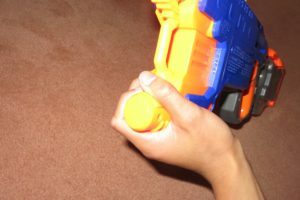 Shaking the blaster with any significant force will also dislodge the lock. Heck, even sustained fire will dislodge the lock! I couldn’t fire it for longer than 2 seconds without the lock popping out of position. I don’t believe this is a problem just with my unit, as I have seen it happen to a completely separate unit at MHvZ, and heard another report of the same problem elsewhere. Hyperfire with an 18 mag. With the included 25 drum. With a 15 dart Worker Dmag. 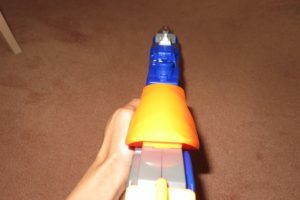 Being part of Nerf’s clip (mag) system, the Hyperfire is compatible with all manner of mags and drums. Above are three of my favourite, aesthetically. 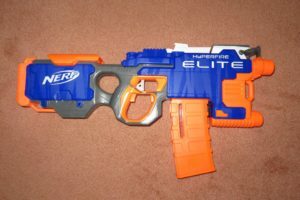 Next to a Stryfe and Rapidstrike. 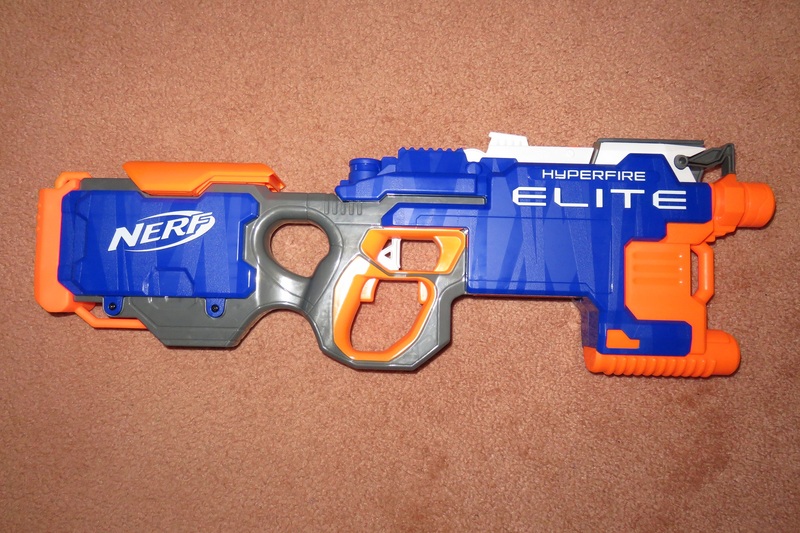 The Hyperfire is not actually that big a blaster–certainly much smaller than I expected. When I first saw it in person, I was quite surprised how small it was. 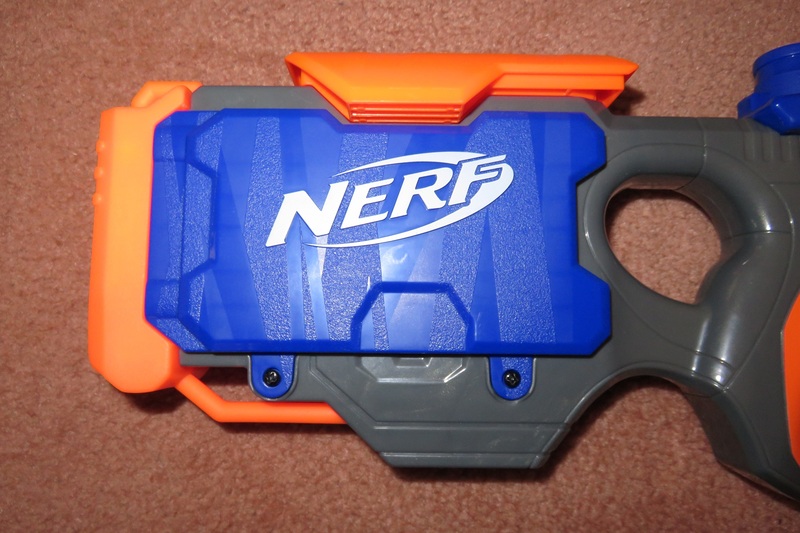 The stock is not especially long, being significantly shorter than a Rapidstrike’s. The front end is also shorter than a Rapidstrike’s, and almost comparable to a Stryfe in length. 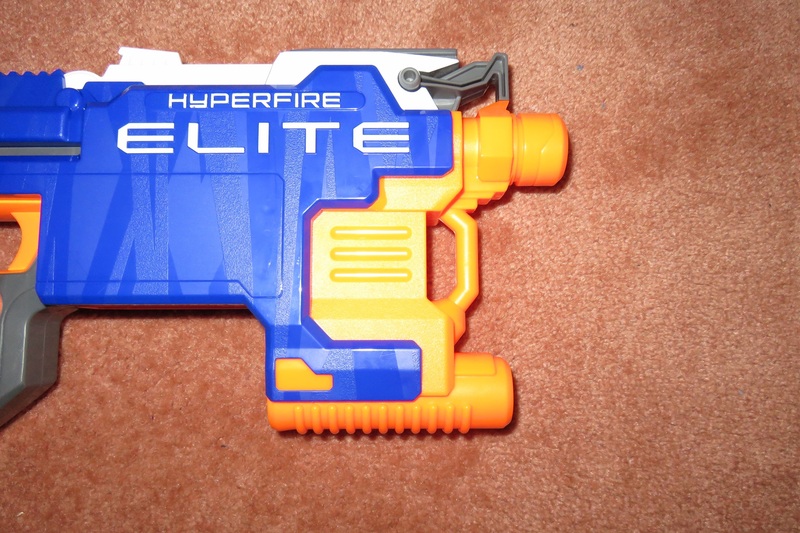 I think that, size wise, the Hyperfire is actually decent–it’s not excessively big nor uncomfortably small. 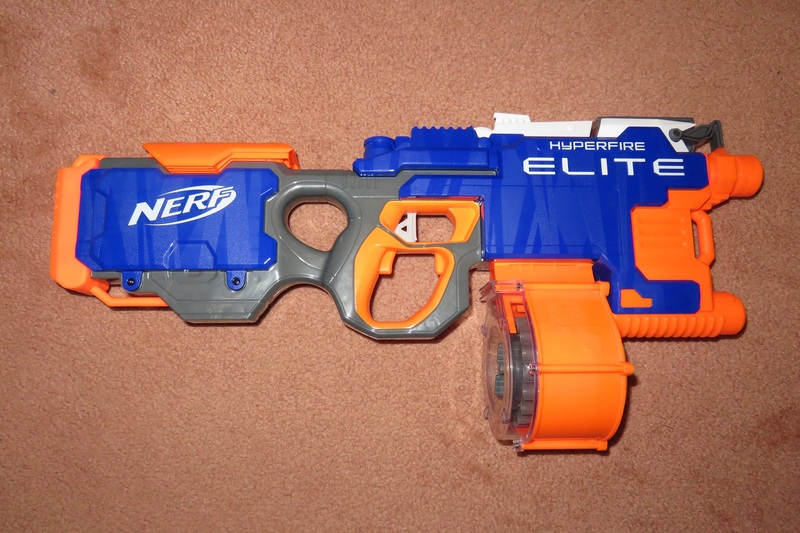 I still think the front end is unnecessarily large, but as a whole, the Hyperfire is well scaled. 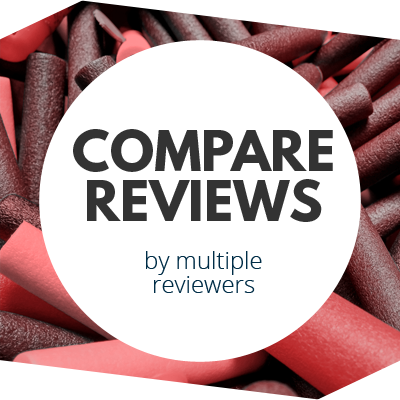 The Hyperfire has a lot of performance claims, can it live up to them? Operating the Hyperfire is the same as any other flywheeler: press the rev trigger to spin up the flywheels, then press the trigger to fire. Because of the lack of cycle control, the time between pulling the trigger and the first dart firing will vary. Range is nothing special. With the flywheels at full speed, a single shot from a grey trigger Hyperfire will reach around 8-10 metres. Rapid fire naturally decreases range substantially, down to maybe 5-6 metres at its worst. Something of note is that the rev trigger has active braking–that is, when the rev trigger is released, the flywheel motors brake to a stop rather than just coasting. This is the first time I’ve seen active braking on a stock blaster’s rev trigger. I’m personally not a fan of flywheel active braking, especially on stock flywheelers which have significant spinup time. Accuracy isn’t anything special, either. Using my testing doorway at ~8 metre range, most of the darts will fly through the doorway (if they reach it). Beyond the doorway though, the darts still like to spread out quite a fair bit. 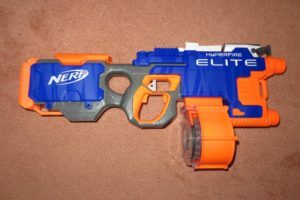 Accuracy is perhaps a little bit better than average for an Elite blaster. 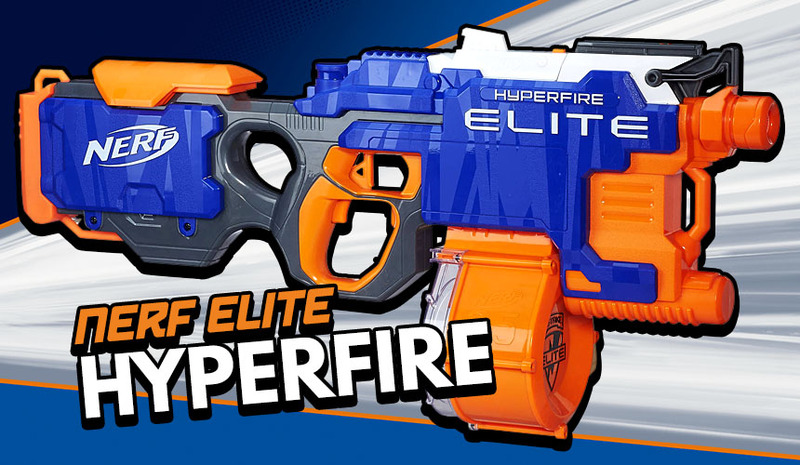 Rate of fire is the Hyperfire’s key selling point, and thankfully, it does not disappoint. With good, new batteries, you’ll probably see a ROF of around 5-6 darts per second. 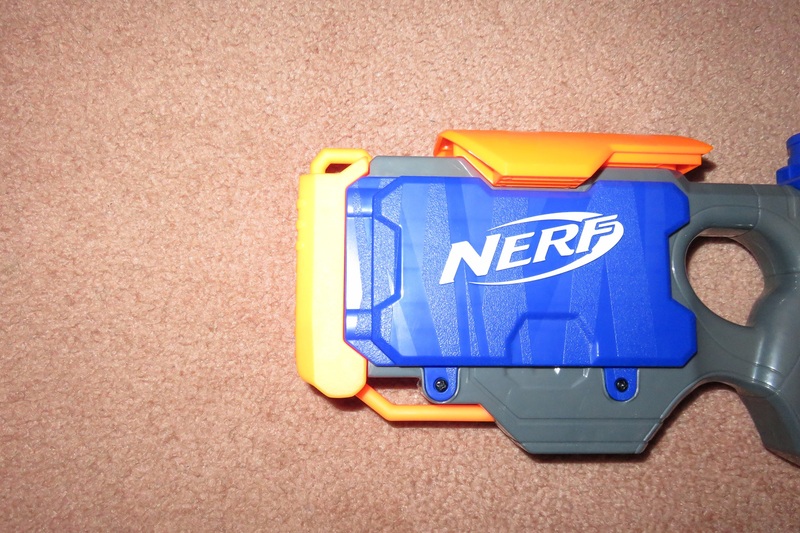 Like the Rapidstrike, the Hyperfire actually achieves its ROF performance claims! Unfortunately, the ROF figure is only relevant if you use perfect darts in a perfect mag or drum. Because of the conveyor belt design, the dart must be particularly round and plump, and must be at the absolute top of the mag, just below the mag lips. 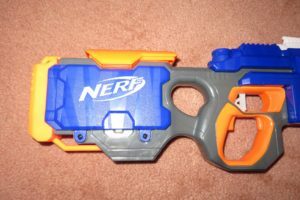 If either of those conditions is not met to the Hyperfire’s extremely strict standards, the dart will not feed properly. 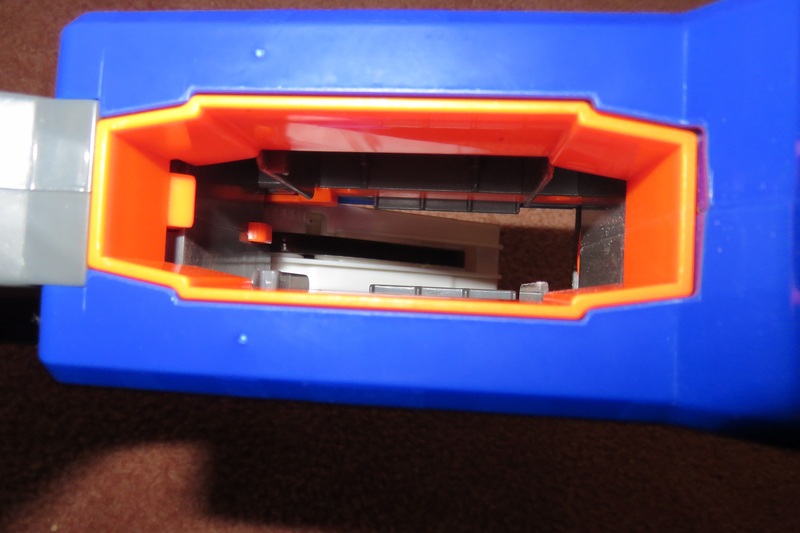 It is possible for a dart to get pushed by the conveyor belt if it is pointing downwards. 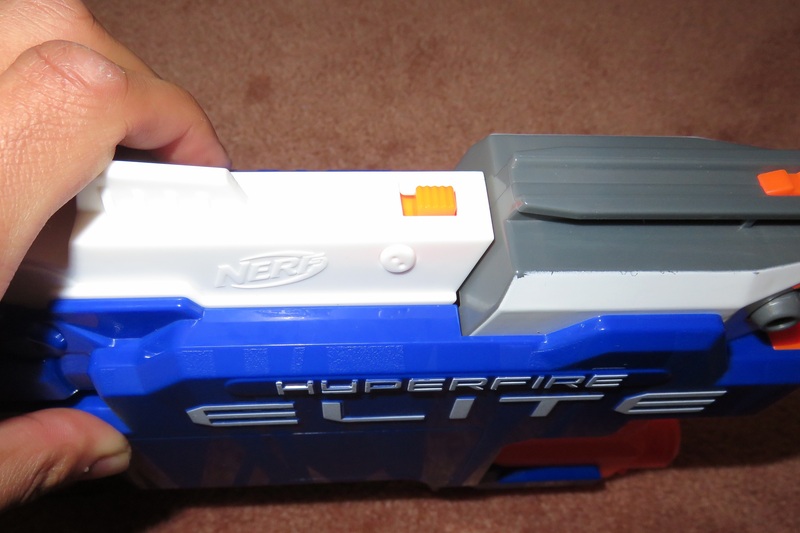 However, the Hyperfire lacks the ramps that lead into the flywheel cage that every other flywheeler has. 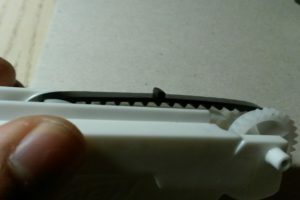 As such, a downward pointing dart can cause the conveyor belt to jam, which not only causes damage to the conveyor belt, but also a complete jam of the system. I have had feed issues with darts and mags that have fed perfectly in my ~15dps Bullpup RS, so for me these issues are inexcusable. 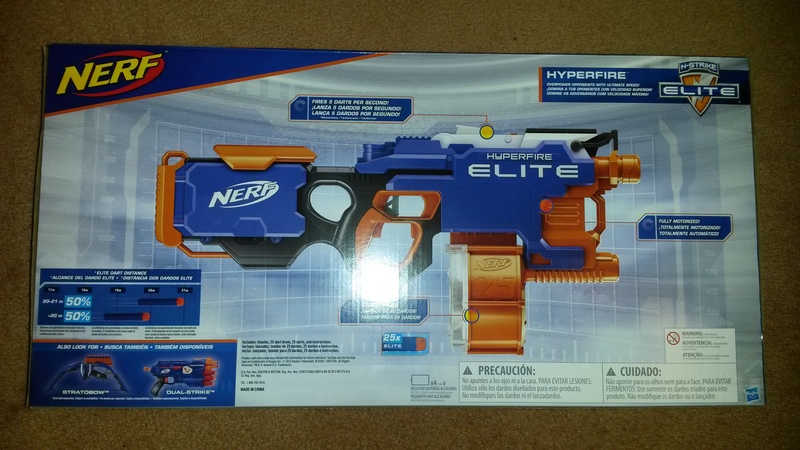 Let’s suppose that the Hyperfire didn’t have the massive flaws that made it practically unusable. Because of its relatively short range (for the grey trigger model at least) and higher than average ROF, it presents itself as a decent suppression and area saturation blaster. Its use of Nerf’s clip (mag) system gives it fast reloads and high capacity, something demonstrated well by its included 25 dart drum. 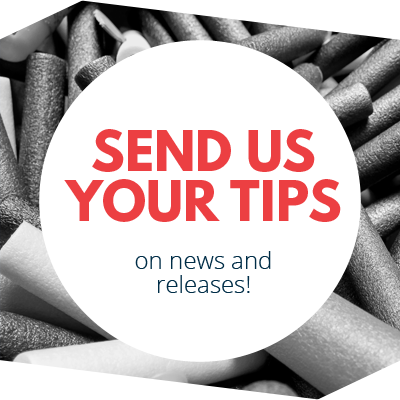 It is very easy to fire off bursts of darts, and also very easy to dump an entire mag/drum towards an area. 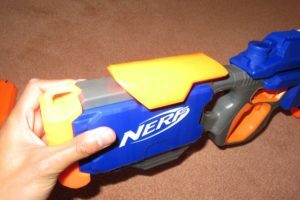 Its relatively poor range and the inherent inaccuracy of Nerf darts means that you’ll likely be firing a lot of angled shots. Its ROF is ideal as an entry point into full auto blasters. It’s fast enough that you get to properly appreciate the benefits of full auto, while still slow enough to control with minimal practice. That being said, the Hyperfire should be avoided if the game is likely to involve scavenging or use of non-perfect or non-new darts. Because of the belt feeding mechanism, any dart that is not particularly plump will struggle to feed, or not feed at all. This problem also applies to any dart that is missing a chunk from the back. 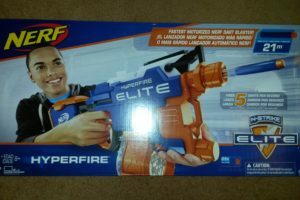 The Hyperfire retails for 80-90AUD. I got mine for 58AUD during a BigW sale, which is a substantial discount, yet I still feel that I didn’t get a very good deal. Sure, a 25 dart drum is nice, but a pair of 18 dart clips would have been better, and generally more useful. 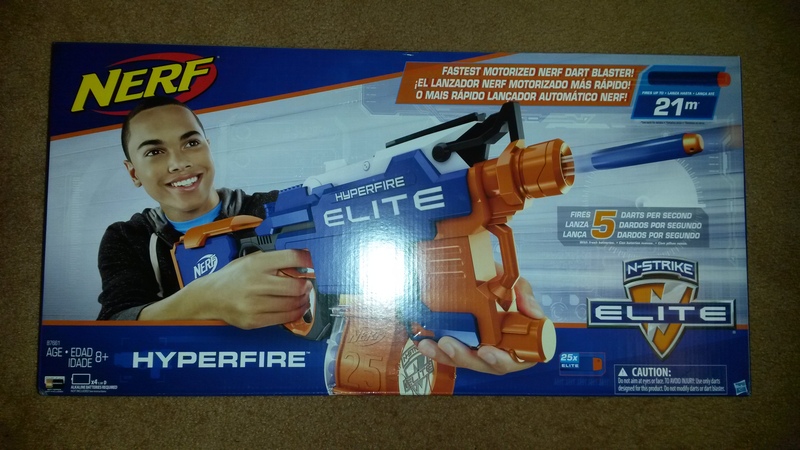 What really breaks the deal for me though is how unusable the Hyperfire is out of box. Yes, as a modder I can fix these problems, but I shouldn’t have to in the first place. I’m perfectly fine with stock blasters being weak in the interests of safety. What I’m not fine with is poorly engineered mechanisms that severely hamper the blaster’s use if not in perfect conditions. In the Hyperfire’s case, I should not have to manually hold the jam door lock closed just to use it. 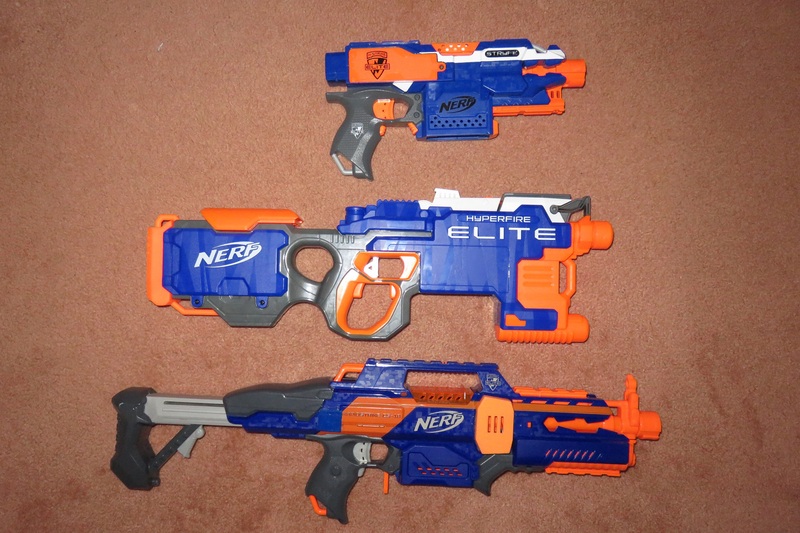 I should also not have feed issues with mags and darts that work perfectly in literally every other blaster I own. While the Hyperfire does have some merit if you’re willing to undertake some basic mods, I cannot recommend it in stock form. 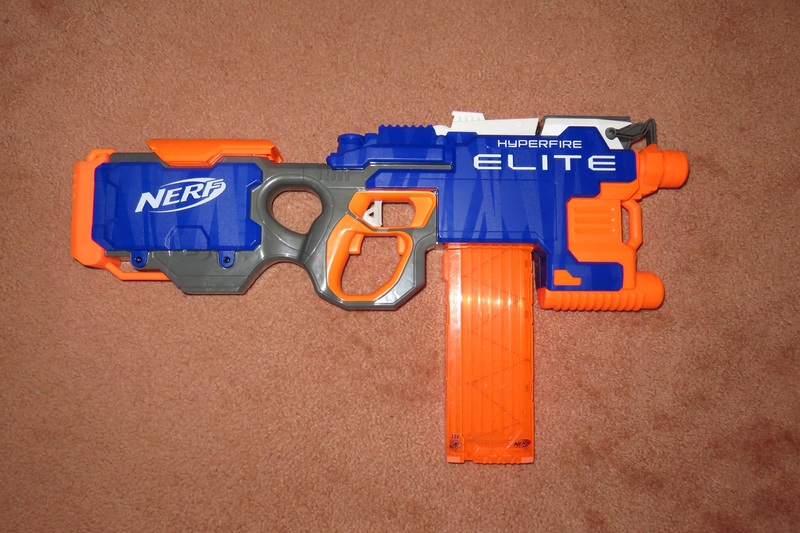 Even if you intend to mod it, I would recommend a Rapidstrike much more highly for the far superior reliability. Close up of the canted flywheels. The Hyperfire is nearly as moddable as most other flywheelers. A standard rewire, reswitch, and battery pack plug do wonders for performance. 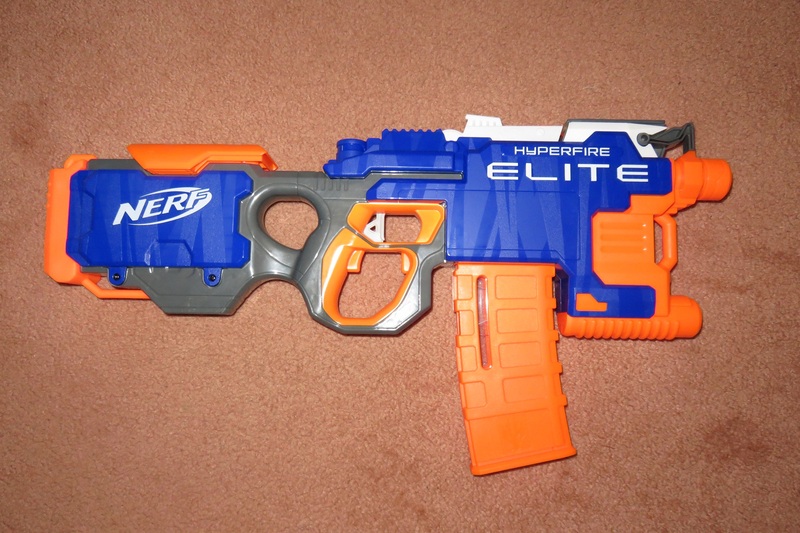 My current Hyperfire has been rewired and reswitched. Using just a 2S LiPo (nominal voltage 7.4V), I was getting significantly improved ranges and a nearly 10 dart per second ROF. At this ROF, dart skipping becomes significantly more prevalent as very few of my clips (mags) can keep up with the Hyperfire’s overly strict requirements. 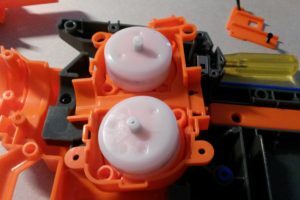 Since the conveyor belt has no cycle control, only two switches are needed (unlike the Rapidstrike’s three), which simplifies wiring significantly. 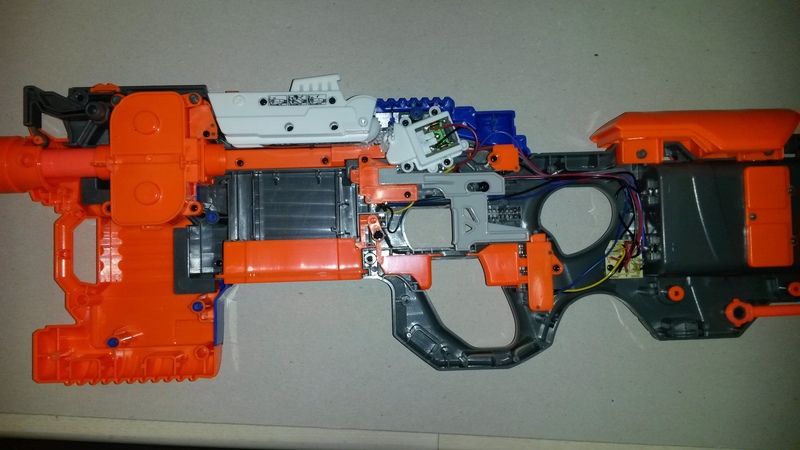 When rewiring, don’t forget to put motor braking on the belt/main trigger for better fire control. 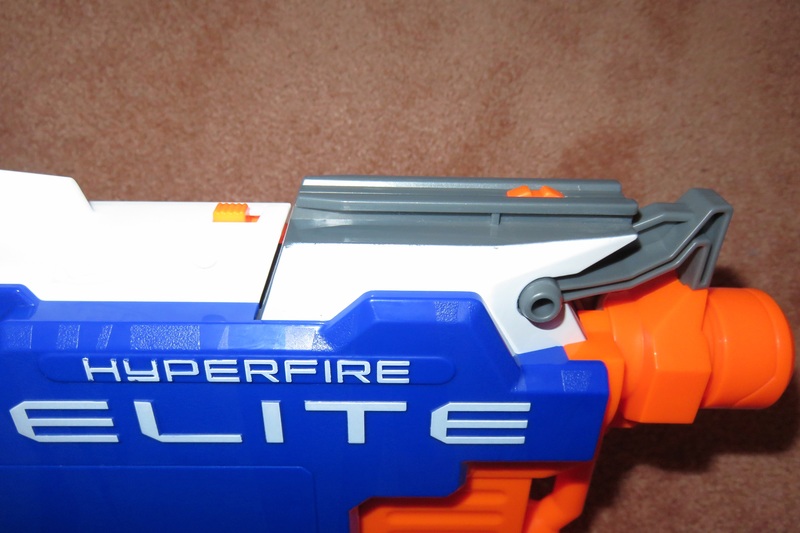 Furthermore, with the removal of some internal screws, the Hyperfire’s shell splits into 3 distinct pieces. 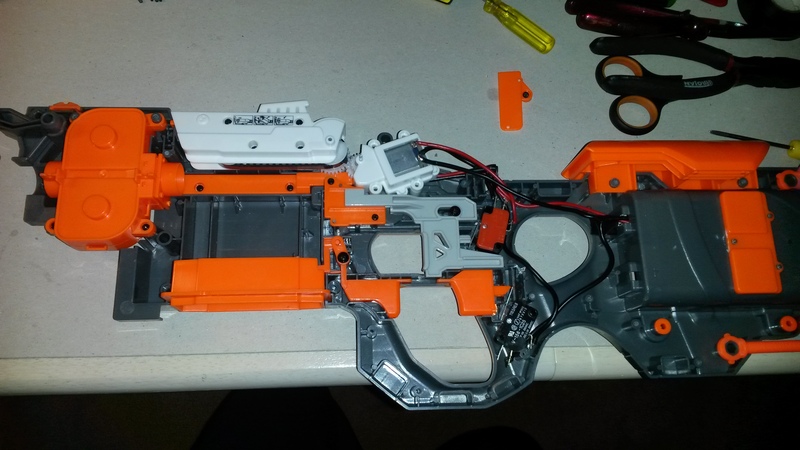 Only the grey piece is needed to hold the internals in place, which helps with aesthetic modding, maintenance, and testing greatly. 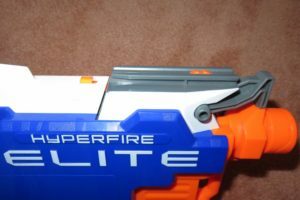 Unfortunately, the Hyperfire has one big problem when it comes to mods. Unlike traditional flywheelers whose flywheels are parallel, the Hyperfire’s flywheels are canted slightly. This seemingly applies spin to darts, which causes a massive problem–full length darts react very poorly to significant spin. A fast enough spinning full length dart will “helicopter” after a few metres of travel. 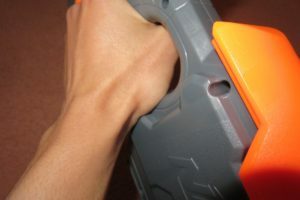 This “helicopter” phenomenon can typically be seen with rifled faux barrels and Koosh darts, though is relatively uncommon when fired out of ordinary blasters. With the Hyperfire, “helicoptering” of darts is far more common. 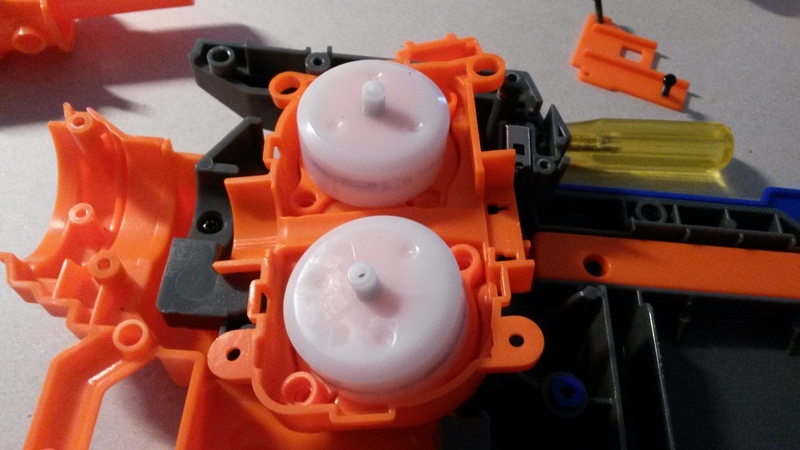 This problem simply gets worse the further you amp up the motors, as the darts get spun faster and faster. 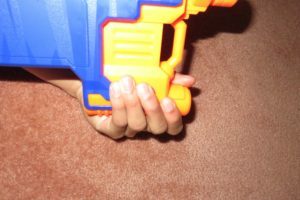 One of the solutions to this is to fabricate a brass dart guide, which will help stop the darts spinning out of control. Additionally, while overvolting the conveyor belt does significantly reduce the lack of cycle control, the problem still remains about how finicky the belt is. 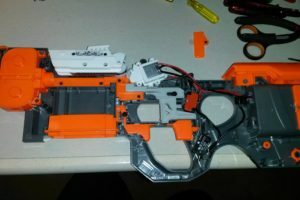 Without straight up replacing the belt, with a custom made one, I see no practical way of making it friendlier to imperfect darts and more reliable with feeding. 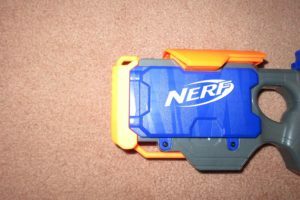 This entry was posted in Dart Blasters, Reviews and tagged 21m, australia, elite, grey, grey trigger, hyperfire, n-strike, nerf, review, trigger on June 26, 2016 by Outback Nerf. Great review. I think you were a tad bit too harsh on the HyperFire, though. Hahaha. Found a slight typo. Otherwise, great article. Thank you for your noticing that! We fixed it now, and are glad you enjoyed the article. I Fully agree with your assessment. 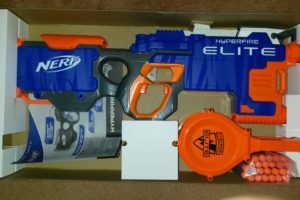 Straight out of the box and this blaster won’t fire more than a handful without having to manually twist the reset knob. Frustrating to say the least. In it’s worst performance it fired 1 bullet and kept wheezing till I had to manually use the reset knob. I am returning this back and I do NOT want to mod as I should not have to do it. What a waste of time. Thanks for your review as it helped me to confirm that I did not receive a lemon. Only the accuracy and distance lack. I can usually hit my enemies though. The ROF overpowers them. Why be accurate when you can spray and pray.